Your local brasserie, Browns, has launched its summer menu, alongside a re-vamped drinks selection in time for the warmer evenings and brighter days. To mark it’s 45th birthday, the St. Paul’s Square restaurant has launched a quartet of new cocktails, including ‘Brighton Rocks’, which is a nod to where the first branch opened in Brighton in 1973. 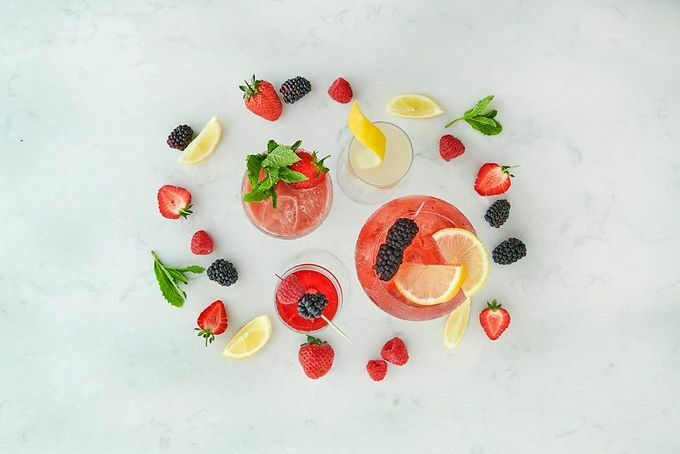 The ‘Brighton Rocks’ combines Tanqueray gin, Chapel Down vodka, Barcardi Carta Blanca rum, Olmeca Altos tequila, strawberry, lemon, vanilla and soda to achieve a zesty kick. On the summer cocktail menu you’ll also find the ‘English 75’, the ‘Hedgerow G&T’ and the ‘Summer Berry Fizz’. Pop in to give them a try, there are even some for only £4.95 during the week (Mon-Fri)! On the new food menu you’ll find main courses including roast fillet of salmon, tender loin of lamb and summer beet salad, as well as seasonal starters like scallops and raspberries or smoked duck salad. There’s then a choice of puds, including home-baked chocolate brownie (we switched out the vanilla ice cream for a zing of raspberry sorbet), apple and gooseberry crumble or peach melba. To see the full updated menu, click here. This Wednesday you’ll also be able to sample summer at Browns at its exclusive taster menu evening from 5pm. Try 3 courses for £19.95 on 20 June and get a glimpse of that summer we’ve been promised! To book your table, call 0114 276 6710 or book online. If that wasn’t enough fantastic food already, you can also enjoy two courses for £10.95 until 7pm, Monday to Friday at Browns this summer. With flaked tuna niçoise, chicken and ham pie and coronation cauliflower on offer alongside elderflower and gin posset or Belgian chocolate torte and plenty of other delicious options (including vegetarian and vegan dishes), the St. Paul’s Square brasserie really does have us covered. Did you know you can spend your Sheffield Gift Card at Browns? More than 85 city centre businesses have already signed up to accept the card including high street brands, independent retailers, food and drink venues, salons, visitor attractions, cinemas and theatres. The Sheffield Gift Card can be bought online and loaded with anything from £5 to £200. As always, be sure to use #SheffAfter5 when sharing your night in the city.